While Javier Calleja has experimented with various formats and mediums over the years, his works consistently evokes the same deceptively simple aesthetic as Yoshitomo Nara, the celebrated Japanese pop artist whom the Spaniard had apprenticed under for several years. But where Nara’s pieces are tinged with pessimism, like cartoonishly rendered children brandishing weaponry to counter the unknown threats hidden within their blank backgrounds, Calleja’s subjects exude a playful optimism. Whether it is the joyful beauty of his micro-scenes or the warm smiles of his child-like subjects, Calleja’s pieces invite the viewer into a utopian world that illuminates the brighter side of life. Over the course of the last dozen years, Calleja has had fifteen solo exhibitions, mostly in his native Spain. But his work has been viewed elsewhere in Europe under the patronage of the likes of Galerie UNA & Fondation Suisse, who sponsored his This is not my universe exhibition in 2012, and Galerie Zink, which displayed his Fast Food showcase in 2015. And while Kidrobot introduced him to an American audience through his contribution to their The Paint Ball event in 2006, the artist would become championed in the States by the Castor Gallery, who presented Calleja’s work through a solo exhibition, No Art Here (2015), and an Art on Paper Fair installation, I Know Nothing (2016). This year, though, has seen his debut to an Asian audience with the Nanzuka Gallery placing him in Art Basel Hong Kong, his solo exhibition Hi at the AishoNanzuka Gallery, and APPortfolio producting his first art toy design in an edition, Missing the Blue Sky. 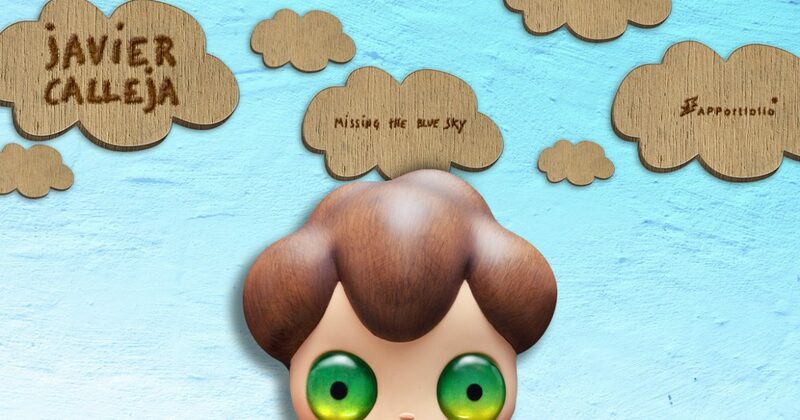 Limited to an edition of 200 copies, each hand-numbered on the cloud-shaped wooden board accompanying it, the Missing the Blue Sky mixed media pieces are composed of fiberglass, metal, and ABS plastic, the hardness of the materials granted Calleja’s signature softness through its smartly executed coloration. Finished with vibrant accents like the gorgeous gypsum eyes and fibrous flocking on the the t-shirt, even the artist’s penchant for incorporating messages is incorporated on the shirt’s front, though the slightly solemnous of its statement has no apparant affect on the uplifting appearance of the character.